Across the world, millions of people burn heat their homes and feed their families using the fuel from thousands of trees. Because of this, forests and their animal inhabitants are suffering. World Wildlife Fund (WWF), a conservation organization, recently launched an initiative to regain environments lost to human destruction. Specifically, they increased the amount of biogas stoves in Nepal. WWF uses science-based solutions to combat climate change and improve the environment in many countries around the world. In Nepal, for example, the WWF biogas stove project is a cost-effective, environmentally friendly way to reduce the cutting down of trees. 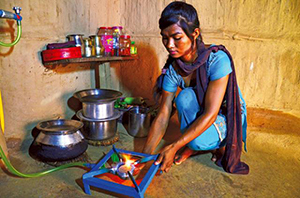 Biogas stoves burn with a smoke-free flame that ultimately improves air quality. Further, they produce heat using the waste of humans, plants, and animals. This waste is collected underground in a “digester.” As the digester breaks down waste, it also emits methane gas. Biogas stoves then use this gas to produce flame. Using waste to fuel this process, these stoves reduce water-borne illnesses and help keep water sources, like rivers, clean. Biogas stoves also benefit humans because their smoke-less flame prevents smoke-related diseases. This directly combats the four million deaths caused each year from smoke-related diseases like respiratory problems and eye illnesses. Clearly, biogas stoves are one tool that we can implement to create in many countries to create a better environment for humans and wildlife alike. If introduced to the United States, these stoves could even help preserve the forest habitats of many endangered species.